The death of a loved one is devastating. There are now four more grieving families in the Jacksonville area after four motorcycle drivers were killed in only a three-day span. Investigations are ongoing, but the preliminary reports state that the drivers of the motorcycles are not at fault. The Jacksonville Sheriff’s Office stated that “it appears vehicles all turned in front” of the motorcycles, according to Action News Jax. One of the victims had just purchased the motorcycle as a birthday present for himself a few weeks prior to the accident. These four accidents were caused by a vehicle failing to yield when a motorcyclist was making a left turn, an SUV turning left that struck the driver, a school bus that turned left in front of the driver, and a fourth two-vehicle crash. Unsafe lane changes. Failure to properly check a blind spot or improperly signal can result in serious crashes. 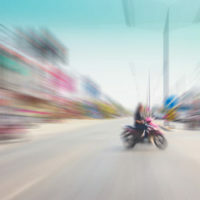 Whether the motorcycle or another vehicle, an increased speed increases the impact of the crash and causes more severe injuries and consequences. Left turn accidents. Commons issues involve “right of way” errors or misjudging the distance between you and another car when making a left turn. Dangerous road conditions. Riding a motorcycle is made even more dangerous when it is done in less than perfect conditions. Sudden stops. A vehicle that is driving too close to a motorcycle can cause serious injury if the motorcycle needs to stop suddenly. If the vehicle is following too closely, there is a greater chance they will not be able to stop before rear-ending the motorcycle. Driving under the influence. Drivers who are operating a motor vehicle under the influence of alcohol or drugs are a danger to everyone on the road, especially motorcycles. Lane splitting. It is not legal in Florida for motorcycles to drive in between lanes of traffic. It is extremely dangerous and can result in serious injury or death. Vehicles that open their doors without looking pose a serious risk to motorcycle drivers. The door can suddenly strike a motorcycle/driver and injure them. There are different types of compensation that you might be entitled to in Florida motorcycle accidents. You may be entitled to medical bills, both past, present, and future, lost wages, pain and suffering, mental anguish, and other life-long bills/results of being injured in an accident. If you or a loved one have been injured in a motorcycle accident, trust the experienced Jacksonville personal injury lawyer. At Gillette Law, we can provide the legal advice and counsel to see your case through to the end. We will exhaust every avenue of financial relief and recovery. Contact us today for a free consultation.